After traveling north, you'll arrive at Oldale Town. It's a small, but peaceful place. Once you enter Oldale Town, you'll notice a person standing between the Pokemon Center and another house. Talk to that person, who turns out to be the PokeMart's store owner, and he'll give you a free Potion. 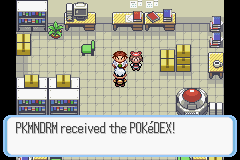 Next, Heal your Pokemon at the Pokemon Center (marked with PC), and go on north to Route 103. If you've trained your Pokemon already, then go on here (at least lv. 7). If not, go here, battle lv. 6+ wild Pokemon, heal your Pokemon at the Pokemon Center, and head on. Route 103 is a dead end. At the very end of this route, you'll meet your rival. Talk to your rival, and she'll battle you. She has a lv. 5 Pokemon that has an advantage in type over you. For example, if you use Torchic, she'll use Mudkip. If you trained your Pokemon well, then there's no problem. Beat her, and she'll walk away. Go back to Oldale Town, and heal your Pokemon if necessary. Your rival is now at the south end of the city. Talk to her, and she'll go back to Little Root Town. You'll also need to go back to your new hometown. Go to the south of the town, and go into the large labratory of the Professor's. Your rival is there, and so is the Professor. Talk to the Professor, and he'll give you a PokeDex and your rival will give you five PokeBalls. After talking to your rival once again, go outside. There, your mom gives you Running Shoes. Holding down "B" when pressing an arrow button enables you to run. After that, you are free to go explore the world of Hoenn! You are now officially starting your journey in the world of Hoenn! Go back to Oldale Town, stock up on some supplies, and go west from there. You'll be on Route 102. You'll have your first trainer battle (not counting the battle with your rival) here. 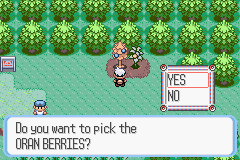 While you're at it, you'll get a look at the new Berry trees, shown on the left. At the south of the route, you'll also find an Itemball with a Potion inside. Crush all the trainers, gain some levels, catch some Pokemon, and sooner than you think, you'll be at Petalburg City.